Mayfly Market & Deli is committed to providing Pittsburgh’s North Side with delicious fare and friendly service — because we’re more than just a neighborhood market — we’re your neighbor. Mayfly offers a great selection of fresh, high quality fruits and vegetables, sourced locally whenever possible. We make all of our soups, salads and sandwiches in-house, from the classics to the delightfully unique (and vegan options too!). See our menu. Mayfly stocks all the basics — from milk and eggs, to canned and dry goods, to household items and more. Sweet tooth? Mayfly offers a delicious selection of cookies and confections, baked by hand daily. Featuring coffee from our North Side neighbors, Commonplace and La Prima, we offer drip coffee, espresso and a variety of packaged beans. Featuring Old World breads from our friends at BreadWorks of Pittsburgh, baked fresh daily with no preservatives. Check out our seasonal selection of fresh, small batch sorbets from Gilligan’s Sorbet. Whether you need a kind gesture or just want to brighten up your home, Mayfly offers fresh, seasonal flowers and foliage year round. At Mayfly, we make it our daily mission to bring delicious, healthy foods and convenience to the residents of Pittsburgh's North Side. We only stock fresh, quality foods and sundries. From fruits and vegetables to meat, cheese and bread, we’ve got a little something for everyone. Looking for a hot coffee, tasty sandwich, seasonal sorbet or fresh flowers? Mayfly has you covered there too. We're also conveniently located just a few blocks from Allegheny General Hospital, the Children’s Museum, Randyland and the Mattress Factory. Featuring fresh, seasonal ingredients and premium meats and cheeses. Served daily. Available in 12 oz. or 16 oz. A curry soup, made with a purée of red lentils, onion, garlic and spices. A traditional Tuscan mixture of bread, tomatoes, garlic and fresh herbs. with cranberry and a miso vinaigrette. with pine nuts, golden raisin and mixed greens. with roasted red pepper, feta and mixed greens. with tomatoes and mixed greens. with sesame, ginger and rice vinegar. with olive oil, red wine vinegar, mayonnaise, Dijon mustard and pickles. shredded cabbage with an oil and vinegar base, carrot and caraway. with egg, cheddar and house made tasso ham on a challah roll. with Gruyère and roasted shallot lavender aioli on multigrain bread. with celery and grapes on multigrain bread. Genoa salami, capicola and sopressata with house pickled peppers and provolone on a hoagie roll. with cilantro sage slaw on a hoagie roll. with Kalamata tapenade on multigrain bread. with whole grain mustard on marble rye bread. Served with a house made pickle. with goat cheese, arugula and fig & rosemary spread on multigrain bread. grilled, with cheddar cheese, apple horseradish sauce and cole slaw on marble rye bread. with shallots, capers, mayonnaise and Gruyère on multigrain bread. with fresh mozzarella, red pepper aioli and arugula on multigrain bread. with remoulade, tomato, and arugula on a challah roll. 1/2 sandwich with soup or salad. Create your own sandwich from our wide selection of meats, cheeses and toppings. Take your sandwich over the top with our selection of fresh veggies and condiments. Ask the deli for our current offerings. Cured meats, cheeses, roasted red peppers, and olives. Available in 1/2 pint containers. Mayfly also carries a full selection of premium meats and cheeses, sliced-to-order, sandwich trays and more. Event? Ask about Mayfly catering. For more information, give us a shout at info@mayflypgh.com. We're currently scooping the following Gilligan's Sorbet flavors. 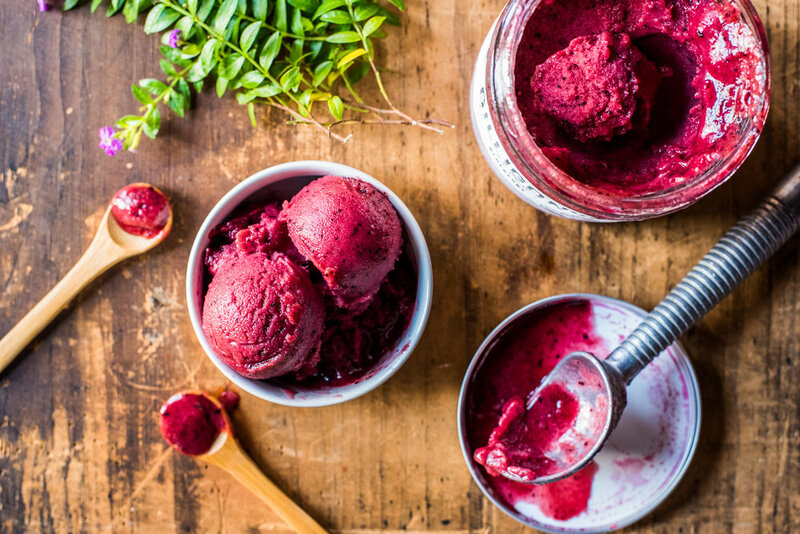 To learn more about their handcrafted, seasonal sorbets, click here.